Anyway, I have also been busy writing stuff for my PhD, including two writing retreats. One retreat was very isolated and full of running, napping and walking. I took myself off to a campsite in East Sussex in mid-May and had a lovely time writing and running during the day and then walking to the pub for dinner and a pint or two, chatting to the cute lambs in the field en route. It was sheer bliss. I fell asleep to the sound of owls, slept for at least 10 hours every night, and the campsite chickens came and tried to nick my food. I had some beautiful runs in the countryside, through beech woods and fields, and I didn’t even get very lost! I would love to do this again sometime, it was very productive and I mostly finished planning a paper I’m wanting to write. It was also very calming to escape from the chaos of everyday life. The second writing retreat was last weekend and organised by the lovely RDP people at uni. We set goals, wrote for 2 days between 10 and about 4, lunch was provided and dinner on the Saturday night (dinner was delicious and it was great to meet people I’d never otherwise encounter). I did a short run round campus both days to shake the day off and to stay awake on the second day. I planned out my methodology chapter and filled in lots of gaps for my 2 studies so far. It was good to be able to focus on the bigger picture of my PhD, especially as I’m up to my eyeballs in data collection and analysis (the latter being apparently never-ending…) Now the challenge is to keep moving forward on daily writing, so far this has been happening most days unless I’ve had to travel to see participants. I’ve been feeling very inspired recently, as I’m interviewing participants from my New Year’s resolution study, and getting feedback from them and hearing how they’ve progressed through the last 6 months has been a real privilege. When you’re bogged down in endless data it’s good to remember why I’m doing this: to understand how we can help people become more active (and stay more active). Sooooo, protracted hiatus from bloggery whilst life has been ultra-busy. I attended a conference in Edinburgh, the International Society of Behavioural Nutrition and Physical Activity (just rolls off the tongue, no?) I had a brilliant time at this conference: the talks were almost all fascinating, I attended a great workshop on intervention design, I didn’t even get to see all the posters I wanted to see, and I made a couple of lovely new friends and met some great people. I didn’t want it to end! 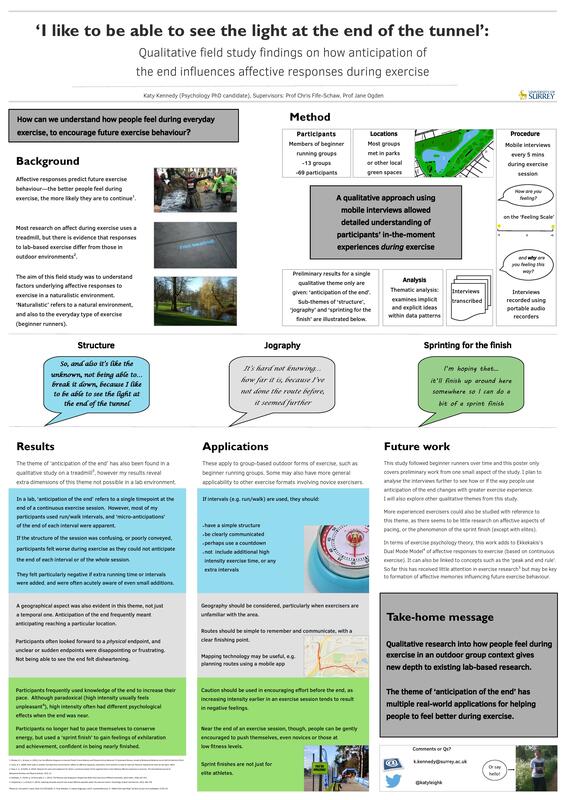 But: having a blog means my poster can live beyond the conference, so here it is! It’s some very preliminary qualitative findings on my Running Commentary study. I’m quite excited about this work, as I can see some useful real-life applications for improving how people feel during exercise just from this single theme alone. I also gave a talk about this work and the wider study as part of our Running Dialogues seminar series which seemed to go OK, it was quite funny as the previous speaker, Hayden Lorimer, gave the most beautiful, lyrical talk just before me, and then you could almost hear the cogs crashing as the audience (and I) had to adjust to the prosaic nature of my study and the realities of operationalising psychological variables! Feel lucky that you don’t have to read it in a crowded conference hall through a sea of people with a crowd playing a noisy game next to you!